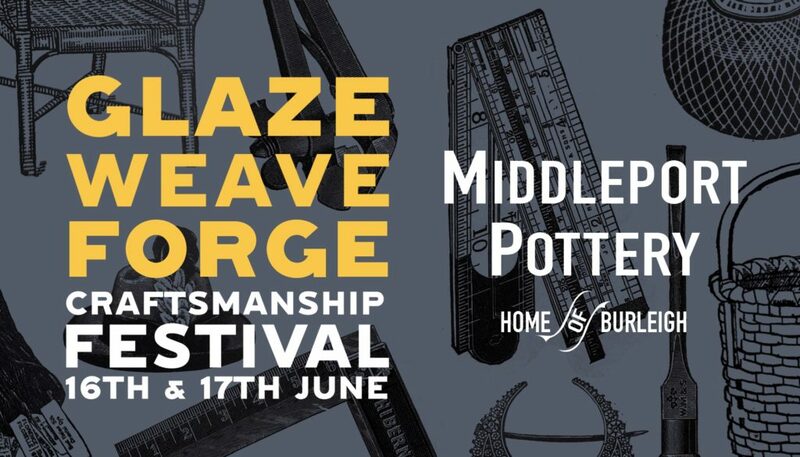 Visitors are welcome to come and celebrate traditional and contemporary handcraft at historic Middleport Pottery, 16th & 17th June. Perfect for Father’s Day. Gates will open to 1000s of visitors over the two-day festival with wares on display from over 50 craftsmen, craftswomen, painters, printmakers, blacksmiths, wood turners and ceramicists. As well as giving the opportunity to buy hand-made crafts, the festival offers unique live demonstrations and hands-on workshops. For refreshments there will be a mini-cider festival and servings of local produce from the Pottery’s popular tearoom. Middleport Pottery’s Event Manager Emily Corlett said, “We’re all extremely passionate about handcraft here at Middleport, it’s in our DNA. We’re delighted to welcome a vast range of craftspeople to Middleport Pottery for what will no doubt be a hugely successful event”. For just £1 entry, visitors can discover Middleport Pottery’s fascinating history with open access to its Heritage Trail. The fully-restored steam engine ‘Duchess’ will be running on steam on Saturday 16th. Rebecca Hopkins Middleport’s Heritage Manager said “when built in 1888, Middleport Pottery was designed to be the model pottery. New Victorian technology, including the cutting-edge Steam Engine, made production more efficient, making it easier for Burleigh’s craftsmen and women in a range of departments to produce the iconic Burleighware. Much of it has unchanged to this day”. The full festival line-up includes demonstrations by The Blacksmith Boat, Soap Carver Peter James, Raku with Muddy Fingers Pottery, woodwork with Canadian Pine, T-Shirt Printing with The Entrepreneurs Network, Wood turning with Barry Wright, Blacksmithing with Genesis Rowley, Ceramics with Alex Allday, Silversmithing with Libby Ward, Ceramic Painters Burslem Pottery and Emma Bailey and Throw-a-pot with Jon French and Cáit Gould. Cáit, a former contestant from the popular Great Pottery Throw Down TV series said: I’m thoroughly looking forward to taking part in this and having the pleasure of spending some more time at Middleport. There has been a resurgence in handcraft, especially studio pottery so I’m over the moon that this is being recognised and celebrated at Middleport Pottery”. Entry £1 entry per person, pay on the door. Free parking available and friendly dogs welcome. Click here to view our Totally Delicious – Middleport Pottery menu.